Newborn fruit flies might not be that different from human babies. Marla Sokolowski, professor in the department of ecology and evolutionary biology at the University of Toronto, looks at the genes of both species and finds a link that could help control obesity for us all. Marla B. Sokolowski, B.Sc. (1977, University of Toronto), Ph.D. (1981, University of Toronto) is a University Professor in the Department of Ecology and Evolutionary Biology, University of Toronto. Her innovative work is esteemed worldwide as a clear, integrative mechanistic paragon of the manner in which genes can interact with the environment, thus impacting behaviour. She has trail-blazed the development of a branch of Behaviour Genetics that addresses the genetic and molecular bases of natural individual differences in behaviour and is best known for her discovery of the foraging gene. She has published well over 140 publications and given close to 250 invited lectures. Professor Sokolowski is an award winning teacher and highly accomplished lecturer. She has supervised over 20 postdoctoral fellows and 35 graduate students with many of her trainees ascending to prestigious national and international academic positions. She has received Distinguished Visiting Professorships in the US and Europe where she contributes regularly to graduate education. She became a Fellow of the Royal Society of Canada in 1998 for her pioneering work in the field of Behavioural Genetics and holds a Tier 1 Canada Research Chair in Genetics and Behavioural Neurology since 2001. In 2004 she became a Fellow of Massey College and in 2007 she received the Genetics Society of Canada’s Award of Excellence. She co-directs the Child and Brain Development Programme of the Canadian Institute for Advanced Research where she is the Weston Fellow. She was the Director of the Life Sciences Division of the Academy of Sciences of the Royal Society of Canada from 2009-2012. 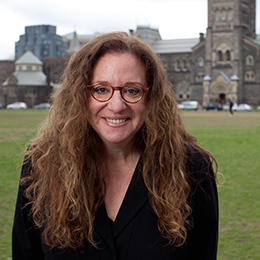 She was named a University Professor at University of Toronto in 2010. In 2013 she was awarded the Queen Elizabeth Diamond Jubilee Medal and the Distinguished Investigator Award from the International Behaviour and Neurogenetics Society (2014). If you’re a newborn fruit fly, you have one job to do – eat as much as you can in order to grow into a full-sized adult. The transformation only takes a few days. Unlike humans, however, the body size of a fruit fly does not change once it becomes an adult – it is fixed, and is based on the feeding success of its initial larval stage, making those first meals very important for its fitness for the rest of its life. Our discovery of a unique foraging gene in fruit flies that controls multiple feeding-related characteristics shows that the extent to which the gene is active in each fly – and the amount does vary – determines the size of its appetite, how much it eats and moves in search of food, and how much it stores fat for energy. We were able to attribute these roles to this particular gene by employing a revolutionary process with which we removed the gene and then added it back in different doses. Fruit flies with high amounts of the gene – known as rovers – tended to move a lot, eat very little, and stay lean. In contrast, fruit flies with low amounts of the gene – known as sitters – behaved in an opposite fashion. So you could imagine if you are a fly, a preference for sugar, a tendency to store fat, and a penchant for moving less than others could all contribute to the likelihood of being obese if you have low levels of the gene. The most curious and promising aspect of our discovery? This foraging gene found in fruit flies is also found in humans. In fact, when scientists first began mapping human genomes and comparing them to other organisms, they were shocked to discover humans don’t have many more genes than flies do. So this is a hint from the fruit fly that may enable the development of methods to control obesity in humans. Genes may contribute to the tendency for someone to become obese after all.